Most haunting of all is one I call the fairy bell ringer. I have never found him. I’m not sure I want to. His voice — and surely he himself — are so ethereal, so delicate, so otherworldly, that he should remain invisible, as he has through all the nights I have searched for him. It is exactly the sound that should come from a bell held in the hand of the tiniest elf, inexpressibly clear and silvery, so faint, so barely-to-be-heard that you hold your breath as you bend closer to the green glades from which the fairy chiming comes. This quote has puzzled readers for a long time. Seemingly, the most apt identity of the singer she was seeking would be the Tinkling Ground Cricket, Allonemobius tinnulus. His song certainly fits the bill — a tiny bell being rung from the woodland floor. The silvery tinkling he produces can’t be heard from very far away as he prefers to hide in the leaf litter, preferable of oaks, as he rings out his chorus. Rachel was certainly not alone in having difficulty finding this diminutive singer. Once one is “certain” where he is singing from and begins to search within the layers of fallen leaves he seems to magically vanish. Other than the very lucky searcher who finds him perched on the surface, the best method to find him seems to be to lay out a light colored sheet, grab a large arm full of leaf litter from where he is singing and plop it on the sheet. Careful searching through the treasures in the mound will finally reveal this elusive songster — usually under the last leaf to be turned. 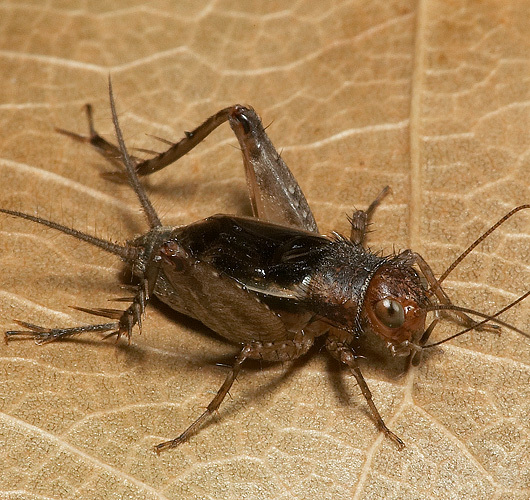 Tinkling Ground Crickets can be found from the southern portion of the New England States south to mid-Georgia, then south from the Gulf coast of Alabama to east Texas then north to extreme southeast Nebraska with a northern limit across northern Illinois, Indiana, Ohio, and then through New York. Here is a recording of the silvery ringing of a Tinkling Ground Cricket on a cool and rainy day in West Virginia. It certainly evokes the image of a tiny fairy rhythmically swinging a tiny silver bell as if calling all the fairies within earshot to assemble. Tinkling Ground Cricket singing from the leaf litter in an oak woodland. Berkeley Co. WV. ©Wil Hershberger September, 2011. What do you think of Rachel’s marvelous description? Have you heard this secretive singer in the woods near you? If not, next time you are in the woods, from late July until frosts silence these singers, listen for the silvery bell being rung from the forest floor both day and night. A careful approach with a flashlight might just reveal the singer perched on a clump of leaves — lord of his minute domain. I am so happy to have found this site, and to learn of the beautiful crickets sounding their tiny bells in the wooded area around my home. I have stopped and listened with a smile many times, wondering what might be performing for all of nature and for me. I wish everyone could experience this magical sound. Excellent! This recording sounds like it’s during the daytime. In fact, I hear a Blue Jay in the background. Yes, I have heard these crickets before. I don’t hear them often, but I do hear them. It sounds like a slow Allard’s Ground Cricket, which I do hear all the time. As Lisa said, we have Allard’s ground crickets all around here in W.NY., but so far I’ve never heard a tinkling ground cricket. I have heard them on our trip to Tenessee a few years back and reading Wil’s post and listening to the recording, you can easily picture these crickets as little fairies with tiny bells. Great to hear that you were able to detect the difference in the songs. Once you get use to the sounds of these two species it is easier. Thanks for your location information as well Lisa. We have Allard’s Ground Crickets just about everywhere here in NE Ohio, but I found Tinkling Ground Crickets on Kelleys Island in western Lake Erie and also on the mainland in the western basin of Lake Erie. They were in dry, open woods as you described. I had wondered if I would recognize the difference, but it was immediately apparent when I heard this lovely, delicate song.